This article is about the capital of Iraq. For other uses, see Baghdad (disambiguation). 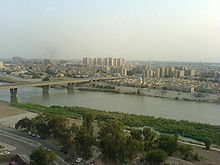 Baghdad (/ˈbæɡdæd, bəɡˈdæd/; Arabic: بغداد‎ [baɣˈdaːd] ( listen)) is the capital of Iraq. The population of Baghdad, as of 2016[update], is approximately 8,765,000,[note 1] making it the largest city in Iraq, the second largest city in the Arab world (after Cairo, Egypt), and the second largest city in Western Asia (after Tehran, Iran). In contemporary times, the city has often faced severe infrastructural damage, most recently due to the 2003 invasion of Iraq, and the subsequent Iraq War that lasted until December 2011. In recent years, the city has been frequently subjected to insurgency attacks. The war had resulted in a substantial loss of cultural heritage and historical artifacts as well. As of 2018[update], Baghdad was listed as one of the least hospitable places in the world to live, ranked by Mercer as the worst of 231 major cities as measured by quality-of-life. Baghdad has tombs of two imams which are Imam musa ibn ja'afer and imam Mohammed Aljawad, they are buried in Kadhem in Baghdad. Arab authors, realizing the pre-Islamic origins of Baghdad's name, generally looked for its roots in Persian. They suggested various meanings, the most common of which was "bestowed by God". 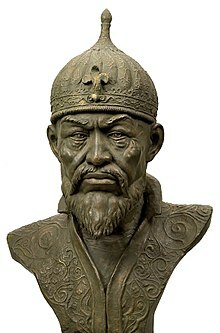 Modern scholars generally tend to favor this etymology, which views the word as a compound of bagh ( ) "god" and dād ( ) "given", In Old Persian the first element can be traced to boghu and is related to Slavic bog "god", while the second can be traced to dadāti, which means ‘to give’ in Sanskrit . A similar term in Middle Persian is the name Mithradāt (Mihrdād in New Persian), known in English by its Hellenistic form Mithridates, meaning "gift of Mithra" (dāt is the more archaic form of dād, related to Latin dat and English donor). There are a number of other locations in the wider region whose names are compounds of the word bagh, including Baghlan and Bagram in Afghanistan or a village called Bagh-šan in Iran. The name of the town Baghdati in Georgia shares the same etymological origins. When the Abbasid caliph, al-Mansur, founded a completely new city for his capital, he chose the name Madinat al-Salaam or City of Peace. This was the official name on coins, weights, and other official usage, although the common people continued to use the old name. [unreliable source?] By the 11th century, "Baghdad" became almost the exclusive name for the world-renowned metropolis. Baghdad eclipsed Ctesiphon, the capital of the Sassanians, which was located some 30 km (19 mi) to the southeast. Today, all that remains of Ctesiphon is the shrine town of Salman Pak, just to the south of Greater Baghdad. Ctesiphon itself had replaced and absorbed Seleucia, the first capital of the Seleucid Empire, which had earlier replaced the city of Babylon. The bricks used to make the city were 18 inches (460 mm) on all four sides. Abu Hanifah was the counter of the bricks and he developed a canal, which brought water to the work site for both human consumption and the manufacture of the bricks. Marble was also used to make buildings throughout the city, and marble steps led down to the river's edge. The basic framework of the city consists of two large semicircles about 19 km (12 mi) in diameter. The city was designed as a circle about 2 km (1.2 mi) in diameter, leading it to be known as the "Round City". The original design shows a single ring of residential and commercial structures along the inside of the city walls, but the final construction added another ring inside the first. Within the city there were many parks, gardens, villas, and promenades. In the center of the city lay the mosque, as well as headquarters for guards. The purpose or use of the remaining space in the center is unknown. The circular design of the city was a direct reflection of the traditional Persian Sasanian urban design. The Sasanian city of Gur in Fars, built 500 years before Baghdad, is nearly identical in its general circular design, radiating avenues, and the government buildings and temples at the centre of the city. This style of urban planning contrasted with Ancient Greek and Roman urban planning, in which cities are designed as squares or rectangles with streets intersecting each other at right angles. The four surrounding walls of Baghdad were named Kufa, Basra, Khurasan, and Syria; named because their gates pointed in the directions of these destinations. The distance between these gates was a little less than 2.4 km (1.5 mi). Each gate had double doors that were made of iron; the doors were so heavy it took several men to open and close them. The wall itself was about 44 m thick at the base and about 12 m thick at the top. Also, the wall was 30 m high, which included merlons, a solid part of an embattled parapet usually pierced by embrasures. This wall was surrounded by another wall with a thickness of 50 m. The second wall had towers and rounded merlons, which surrounded the towers. This outer wall was protected by a solid glacis, which is made out of bricks and quicklime. Beyond the outer wall was a water-filled moat. Baghdad and southern Iraq remained under Ottoman rule until 1917, when captured by the British during World War I. In 1920, Baghdad became the capital of the British Mandate of Mesopotamia with several architectural and planning projects commissioned to reinforce this administration. After receiving independence in 1932, the capital of the Kingdom of Iraq. The city's population grew from an estimated 145,000 in 1900 to 580,000 in 1950. During the Mandate, Baghdad's substantial Jewish community comprised a quarter of the city's population. 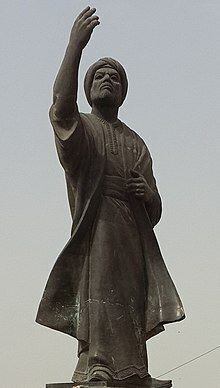 Al-Mutanabbi Statue at the end of Mutanabbi Street beside the Tigris. Points of interest include the National Museum of Iraq whose priceless collection of artifacts was looted during the 2003 invasion, and the iconic Hands of Victory arches. Multiple Iraqi parties are in discussions as to whether the arches should remain as historical monuments or be dismantled. Thousands of ancient manuscripts in the National Library were destroyed under Saddam's command. The zoological park used to be the largest in the Middle East. Within eight days following the 2003 invasion, however, only 35 of the 650 animals in the facility survived. This was a result of theft of some animals for human food, and starvation of caged animals that had no food. South African Lawrence Anthony and some of the zoo keepers cared for the animals and fed the carnivores with donkeys they had bought locally. Eventually, Paul Bremer, Director of the Coalition Provisional Authority in Iraq from 11 May 2003 to 28 June 2004 ordered protection of the zoo and U.S. engineers helped to reopen the facility. Grand Festivities Square is the main square where public celebrations are held and is also the home to three important monuments commemorating Iraqi's fallen soldiers and victories in war; namely Al-Shaheed Monument, the Victory Arch and the Unknown Soldier's Monument. Al-Shaheed Monument (Arabic: نصب الشهيد‎), also known as the Martyr's Memorial, is a monument dedicated to the Iraqi soldiers who died in the Iran–Iraq War. However, now it is generally considered by Iraqis to be for all of the martyrs of Iraq, especially those allied with Iran and Syria currently fighting ISIS, not just of the Iran–Iraq War. The Monument was opened in 1983, and was designed by the Iraqi architect Saman Kamal and the Iraqi sculptor and artist Ismail Fatah Al Turk. During the 1970s and 1980s, Saddam Hussein's government spent a lot of money on new monuments, which included the al-Shaheed Monument. Qushla (or Qishla, Arabic: قشلة‎) is a public square and the historical complex located in Rusafa neighborhood at the riverbank of Tigris. Qushla and its surroundings is where the historical features and cultural capitals of Baghdad are concentrated, from the Mutanabbi Street, Abbasid-era palace and bridges, Ottoman-era mosques to the Mustansariyah Madrasa. The square developed during the Ottoman era as a military barracks. Today, it is a place where the citizens of Baghdad find leisure such as reading poetry in gazebos. It is characterized by the iconic clock tower which was donated by George V. The entire area is currently submitted to the UNESCO World Heritage Site Tentative list. Al-Kadhimiyyah Masjid is a shrine that is located in the Kādhimayn suburb of Baghdad. It contains the tombs of the seventh and ninth Twelver Shi'ite Imams, Musa al-Kadhim and Muhammad at-Taqi respectively, upon whom the title of Kāẓimayn (Arabic: كَـاظِـمَـيـن‎, "Two who swallow their anger") was bestowed. Many Shi'ites travel to the mosque from far away places to commemorate. Firdos Square is a public open space in Baghdad and the location of two of the best-known hotels, the Palestine Hotel and the Sheraton Ishtar, which are both also the tallest buildings in Baghdad. The square was the site of the statue of Saddam Hussein that was pulled down by U.S. coalition forces in a widely televised event during the 2003 invasion of Iraq. Administratively, Baghdad Governorate is divided into districts which are further divided into sub-districts. Municipally, the governorate is divided into 9 municipalities, which have responsibility for local issues. Regional services, however, are coordinated and carried out by a mayor who oversees the municipalities. There is no single city council that singularly governs Baghdad at a municipal level. The governorate council is responsible for the governorate-wide policy. These official subdivisions of the city served as administrative centres for the delivery of municipal services but until 2003 had no political function. Beginning in April 2003, the U.S. controlled Coalition Provisional Authority (CPA) began the process of creating new functions for these. The process initially focused on the election of neighbourhood councils in the official neighbourhoods, elected by neighbourhood caucuses. Baghdad has a subtropical desert climate (Köppen climate classification BWh), featuring extremely hot, dry summers and mild, damp winters. In the summer, from June through August, the average maximum temperature is as high as 44 °C (111 °F), accompanied by blazing sunshine. Rainfall has, in fact, been recorded on fewer than half a dozen occasions at this time of year and has never exceeded 1 millimetre (0.04 in). Even at night temperatures in summer are seldom below 24 °C (75 °F). Baghdad's record highest temperature of 51 degrees Celsius (124 degrees Fahrenheit) was reached in July 2015. The humidity is typically under 50% in summer due to Baghdad's distance from the marshy southern Iraq and the coasts of Persian Gulf, and dust storms from the deserts to the west are a normal occurrence during the summer. Winters boast temperatures typical of subtropical climates. From December through February, Baghdad has maximum temperatures averaging 15.5 to 18.5 °C (59.9 to 65.3 °F), though highs above 21 °C (70 °F) are not unheard of. The average January low is 3.8 °C (38.8 °F), but lows below freezing occur a couple of times per year on average. Baghdad's population was estimated at 7.22 million in 2015. 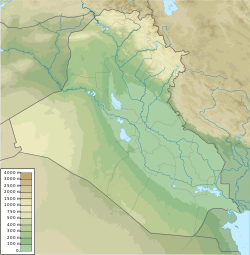 The city historically had a predominantly Sunni population, but by the early 21st century around 82% of the city's population were Iraqi Shia. At the beginning of the 21st century, some 1.5 million people migrated to Baghdad, most of them Shiites and a few Sunnis. Sunni muslims make up 23% of Iraq's population and they are still a majority in west and north Iraq. As early as 2003, about 20 percent of the population of the city was the result of mixed marriages between Shi'ites and Sunnis: they are often referred to as "Sushis". Following the sectarian violence in Iraq between the Sunni and Shia militia groups during the U.S. occupation of Iraq, the city's population became overwhelmingly Shia. Despite the government's promise to resettle Sunnis displaced by the violence, little has been done to bring this about. The Iraqi Civil War following ISIS' invasion in 2014 caused hundreds of thousands of Iraqi internally displaced people to flee to the city. The city currently has Sunni, Shia, Assyrian/Chaldean/Syriacs, Armenians and mixed neighborhoods. Baghdad accounts for 22.2 per cent of Iraq's population and 40 per cent of the country's gross domestic product (PPP). Iraqi Airways, the national airline of Iraq, has its headquarters on the grounds of Baghdad International Airport in Baghdad. Al-Naser Airlines has its head office in Karrada, Baghdad. Most Iraqi reconstruction efforts have been devoted to the restoration and repair of badly damaged urban infrastructure. More visible efforts at reconstruction through private development, like architect and urban designer Hisham N. Ashkouri's Baghdad Renaissance Plan and the Sindbad Hotel Complex and Conference Center have also been made. A plan was proposed by a Government agency to rebuild a tourist island in 2008. In late 2009, a construction plan was proposed to rebuild the heart of Baghdad, but the plan was never realized because corruption was involved in it. The Baghdad Eye, a 198 m (650 ft) tall Ferris wheel, was proposed for Baghdad in August 2008. At that time, three possible locations had been identified, but no estimates of cost or completion date were given. In October 2008, it was reported that Al-Zawraa Park was expected to be the site, and a 55 m (180 ft) wheel was installed there in March 2011. In October 2008, the Baghdad Metro resumed service. It connects the center to the southern neighborhood of Dora. In May 2010, a new residential and commercial project nicknamed Baghdad Gate was announced. This project not only addresses the urgent need for new residential units in Baghdad but also acts as a real symbol of progress in the war torn city, as Baghdad has not seen projects of this scale for decades. The Mustansiriya Madrasah was established in 1227 by the Abbasid Caliph al-Mustansir. The name was changed to Al-Mustansiriya University in 1963. The University of Baghdad is the largest university in Iraq and the second largest in the Arab world. 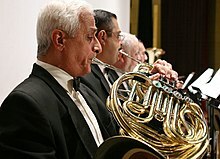 The Iraqi National Symphony Orchestra, officially founded in 1959, performing a concert in Iraq in July 2007. Baghdad has always played a significant role in the broader Arab cultural sphere, contributing several significant writers, musicians and visual artists. Famous Arab poets and singers such as Nizar Qabbani, Umm Kulthum, Fairuz, Salah Al-Hamdani, Ilham al-Madfai and others have performed for the city. The dialect of Arabic spoken in Baghdad today differs from that of other large urban centres in Iraq, having features more characteristic of nomadic Arabic dialects (Versteegh, The Arabic Language). It is possible that this was caused by the repopulating of the city with rural residents after the multiple sackings of the late Middle Ages. Baghdad joined the UNESCO Creative Cities Network as a City of Literature in December 2015. Some of the important cultural institutions in the city include the National Theater, which was looted during the 2003 invasion of Iraq, but efforts are underway to restore the theatre. The live theatre scene received a boost during the 1990s, when UN sanctions limited the import of foreign films. As many as 30 movie theatres were reported to have been converted to live stages, producing a wide range of comedies and dramatic productions. Institutions offering cultural education in Baghdad include The Music and Ballet School of Baghdad and the Institute of Fine Arts Baghdad. The Iraqi National Symphony Orchestra is a government funded symphony orchestra in Baghdad. The INSO plays primarily classical European music, as well as original compositions based on Iraqi and Arab instruments and music. Baghdad is also home to a number of museums which housed artifacts and relics of ancient civilization; many of these were stolen, and the museums looted, during the widespread chaos immediately after United States forces entered the city. During the 2003 occupation of Iraq, AFN Iraq ("Freedom Radio") broadcast news and entertainment within Baghdad, among other locations. There is also a private radio station called "Dijlah" (named after the Arabic word for the Tigris River) that was created in 2004 as Iraq's first independent talk radio station. Radio Dijlah offices, in the Jamia neighborhood of Baghdad, have been attacked on several occasions. Priceless collection of artifacts in the National Museum of Iraq was looted during the 2003 US-led invasion. Thousands of ancient manuscripts in the National Library were destroyed under Saddam's command and because of neglect by the occupying coalition forces. Baghdad is home to some of the most successful football (soccer) teams in Iraq, the biggest being Al-Shorta (Police), Al-Quwa Al-Jawiya (Airforce club), Al-Zawra'a, and Talaba (Students). The largest stadium in Baghdad is Al-Shaab Stadium, which was opened in 1966. The city has also had a strong tradition of horse racing ever since World War I, known to Baghdadis simply as 'Races'. There are reports of pressures by the Islamists to stop this tradition due to the associated gambling. ^ a b Estimates of total population differ substantially. The Encyclopedia Britannica gives the city 2001-2006 population of 4,950,000;[not in citation given] the 2006 Lancet Report states a population of 7,216,050; Mongabay gives a figure of 6,492,200 as of 2002. ^ Petersen, Andrew (13 September 2011). "Baghdad (Madinat al-Salam)". Islamic Arts & Architecture. Archived from the original on 16 September 2016. Retrieved 23 August 2016. ^ "Baghdad" Archived 22 December 2016 at the Wayback Machine Encyclopædia Britannica. Encyclopædia Britannica Online. 30 November 2016. ^ "Largest Cities Through History". Geography.about.com. 6 April 2011. Archived from the original on 24 June 2007. Retrieved 19 June 2011. ^ "Baghdad, Foundation and early growth". Encyclopædia Britannica. Archived from the original on 9 October 2015. Retrieved 21 October 2015. [...] the site located between present-day Al-Kāẓimiyyah and Al-Karkh and occupied by a Persian village called Baghdad, was selected by al-Manṣūr, the second caliph of the Abbāsid dynasty, for his capital. ^ E.J. Brill's First Encyclopaedia of Islam 1913-1936. 1987. ISBN 978-9004082656. ^ "BAGHDAD i. 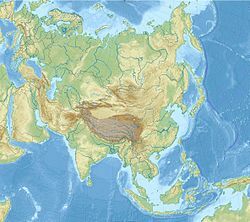 Before the Mongol Invasion – Encyclopædia Iranica". Iranicaonline.org. Archived from the original on 17 November 2017. Retrieved 16 December 2013. ^ "Persimmons surviving winter in Bagdati, Georgia". Georgian Journal. 22 February 2016. Archived from the original on 23 September 2016. Retrieved 22 September 2016. ^ "ما معنى اسم مدينة بغداد ومن سماه ؟". Seenjeem.maktoob.com. Archived from the original on 13 July 2012. Retrieved 27 April 2010. ^ "Abbasid Ceramics: Plan of Baghdad". Archived from the original on 25 March 2003. Retrieved 5 October 2014. Encyclopædia Iranica, Columbia University, p.413. ^ a b When Baghdad was centre of the scientific world. The Guardian. Retrieved February 16, 2019. ^ Meri, Josef (12 January 2018). Routledge Revivals: Medieval Islamic Civilization (2006). doi:10.4324/9781315162416. ISBN 9781315162416. ^ "syriacs during the islamic golden age - Google Search". www.google.com. Retrieved 5 February 2019. ^ HumWest (14 March 2015). "Baghdad in Its Golden Age (762-1300) | April 25–26, 2014". Humanities West. Retrieved 5 February 2019. ^ Falagas, Matthew E.; Zarkadoulia, Effie A.; Samonis, George (1 August 2006). "Arab science in the golden age (750–1258 C.E.) and today". The FASEB Journal. 20 (10): 1581–1586. doi:10.1096/fj.06-0803ufm. ISSN 0892-6638. PMID 16873881. ^ "Largest Cities Through History". Geography.about.com. 2 November 2009. Archived from the original on 24 June 2007. Retrieved 27 April 2010. ^ George Modelski, World Cities: –3000 to 2000, Washington, D.C.: FAROS 2000, 2003. ISBN 978-0-9676230-1-6. See also Evolutionary World Politics Homepage Archived 20 May 2007 at the Wayback Machine. ^ Trudy Ring, Robert M. Salkin, K. A. Berney, Paul E. Schellinger (1996). "International dictionary of historic places, Volume 4: Middle East and Africa". Taylor and Francis: 116. ^ Bosworth, C.E. ; Donzel, E. van; Heinrichs, W.P. ; Pellat, Ch., eds. (1998). Encyclopaedia of Islam, Volume VII (Mif-Naz). BRILL. p. 1032. ISBN 9789004094192. 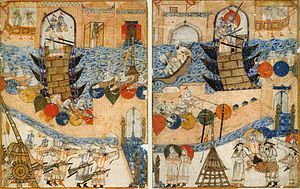 ^ "Baghdad Sacked by the Mongols | History Today". www.historytoday.com. Archived from the original on 10 September 2018. Retrieved 9 September 2018. ^ Cooper, William W.; Yue, Piyu (15 February 2008). Challenges of the Muslim World: Present, Future and Past. Emerald Group Publishing. ISBN 9780444532435. Archived from the original on 9 September 2018. Retrieved 9 September 2018. ^ Jackson, Iain (2 April 2016). "The architecture of the British Mandate in Iraq: nation-building and state creation". The Journal of Architecture. 21 (3): 375–417. doi:10.1080/13602365.2016.1179662. ISSN 1360-2365. ^ Edmund A. Ghareeb; Beth Dougherty (18 March 2004). Historical Dictionary of Iraq. Scarecrow Press. p. 125. ISBN 978-0-8108-6568-6. Jews represented 2.5 percent of 'Iraq's population and 25 percent of Baghdad's. ^ Spencer, Richard (22 December 2014). "Iraq crisis: The last Christians of Dora". Archived from the original on 13 April 2018. Retrieved 5 April 2018. ^ Owles, Eric (18 December 2008). "Then and Now: A New Chapter for Baghdad Book Market". The New York Times. Archived from the original on 21 December 2008. Retrieved 19 May 2010. ^ a b "The Choice, featuring Lawrence Anthony". BBC radio 4. 4 September 2007. Archived from the original on 10 October 2017. Retrieved 4 September 2007. ^ Al-Qushla: Iraq's oasis of free expression. Archived 16 January 2018 at the Wayback Machine Al-Jazeera. Retrieved January 16, 2018. ^ 5880 Archived 4 January 2018 at the Wayback Machine. UNESCO. Retrieved January 16, 2018. ^ افتتاحية قبة الامام الجواد عليه السلام. www.aljawadain.org (in Arabic). Archived from the original on 13 August 2009. Retrieved 27 April 2009. ^ البدء بإعمار وتذهيب قبة الإمام الكاظم عليه السلام. www.aljawadain.org (in Arabic). Archived from the original on 13 August 2009. Retrieved 27 April 2009. ^ "Iraq: A Guide to the Green Zone". Newsweek. 17 December 2006. Archived from the original on 27 January 2018. Retrieved 27 January 2018. ^ "New troops to move into Iraq". USA Today. ^ "DefenseLink News Article: Soldier Helps to Form Democracy in Baghdad". Defenselink.mil. Archived from the original on 31 August 2009. Retrieved 27 April 2010. ^ "Zafaraniya Residents Get Water Project Update - DefendAmerica News Article". Defendamerica.mil. Archived from the original on 28 December 2008. Retrieved 27 April 2010. ^ Frank, Thomas (26 March 2006). "Basics of democracy in Iraq include frustration". USA Today. Archived from the original on 15 May 2011. Retrieved 26 April 2010. ^ "DefendAmerica News - Article". Defendamerica.mil. Archived from the original on 27 December 2008. Retrieved 27 April 2010. ^ "Democracy from scratch". csmonitor.com. 5 December 2003. Archived from the original on 3 April 2010. Retrieved 27 April 2010. ^ "Leaders Highlight Successes of Baghdad Operation - DefendAmerica News Article". Defendamerica.mil. Archived from the original on 28 December 2008. Retrieved 27 April 2010. ^  Archived 2 August 2015 at the Wayback Machine Accessed 31 July 2015. ^ "World Weather Information Service". worldweather.wmo.int. 26 October 2016. Archived from the original on 27 October 2016. Retrieved 26 October 2016. ^ (AFP) – 11 January 2008 (11 January 2008). "Afp.google.com, First snow for 100 years falls on Baghdad". Archived from the original on 29 September 2010. Retrieved 27 April 2010. ^ "World Weather Information Service - Baghdad". World Meteorological Organization. Archived from the original on 25 June 2013. Retrieved 20 June 2013. ^ "Baghdad Climate Guide to the Average Weather & Temperatures, with Graphs Elucidating Sunshine and Rainfall Data & Information about Wind Speeds & Humidity". Climate & Temperature. Archived from the original on 6 January 2012. Retrieved 25 December 2011. ^ Kamal, Nesrine (18 June 2016). "'Sushi' children defy Sunni-Shia divide". BBC News. Archived from the original on 10 October 2018. Retrieved 21 July 2018. ^ "Iraqi Airways". Archived from the original on 18 May 2008. Retrieved 7 February 2016. CS1 maint: BOT: original-url status unknown (link) Arab Air Carriers Organization. Retrieved on 19 October 2009. ^ "Contact Us Archived 15 February 2011 at the Wayback Machine." Al-Naser Airlines. Retrieved on 13 February 2011. "Main Branch: Al-Karrada, Babil Region - Distrlct 929 [sic] - St21 - Home 46 - Beside Al Jadirya Private Hospital. [...] Iraq- Baghdad." ^ Goode, Erica; Mohammed, Riyadh (20 September 2008). "The New York Times". The New York Times. nytimes.com. Archived from the original on 6 October 2014. Retrieved 5 October 2014. ^ Mohammed, Riyadh; Leland, John (29 December 2009). "The New York Times". The New York Times. nytimes.com. Archived from the original on 6 October 2014. Retrieved 5 October 2014. ^ a b Yacoub, Sameer. "Baghdad plans to build giant Ferris wheel". MSNBC. Archived from the original on 29 August 2008. Retrieved 27 August 2008. ^ "Iraq plans giant Ferris wheel, hopes to lure tourists to Baghdad". Archived from the original on 1 December 2016. Retrieved 30 November 2016. ^ Jared Jacang Maher (October 2008). "Obama ad attacks McCain for Baghdad Ferris wheel project being built on land leased by a Democratic Party donor". Westword. Archived from the original on 14 January 2015. Retrieved 31 May 2014. ^ AFP (21 March 2011). "New Ferris wheel attracts leisure-starved Iraqis". dawn.com. Archived from the original on 24 August 2011. Retrieved 31 May 2014. ^ "Baghdad Gate". Iraqi News. Archived from the original on 14 January 2013. Retrieved 24 May 2010. 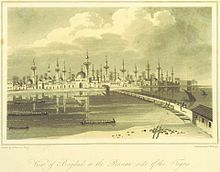 ^ "Baghdad Investment: Creating (1824) housing units in Baghdad". Baghdad Governorate Website. 2010. Archived from the original on 23 March 2010. Retrieved 9 July 2010. ^ "Arrêté du 22 novembre 1990 complétant l'arrêté du 23 août 1990 fixant la liste des établissements d'enseignement prévue à l'article 1er du décret no 90-469 du 31 mai 1990" (Archive). Legislature of France. Retrieved on 12 March 2016. ^ "Deutscher Bundestag 4. Wahlperiode Drucksache IV/3672" (Archive). Bundestag (West Germany). 23 June 1965. Retrieved on 12 March 2016. p. 35/51. ^ "Baghdad selected as new member of 'UNESCO Creative Cities Network'". Retrieved 3 October 2018. ^ "In Baghdad, Art Thrives As War Hovers". Commondreams.org. 2 January 2003. Archived from the original on 27 June 2010. Retrieved 27 April 2010. ^ "Gunmen storm independent radio station in latest attack against media in Iraq". International Herald Tribune. 29 March 2009. Archived from the original on 10 October 2017. Retrieved 30 November 2016. ^ "Occupation and international humanitarian law: Questions and answers - ICRC". 4 August 2004. Archived from the original on 4 October 2017. Retrieved 16 January 2018. ^ "Twinning the Cities". City of Beirut. Archived from the original on 21 February 2008. Retrieved 13 January 2008. This page was last edited on 26 April 2019, at 04:19 (UTC).